I forgot to say in the last entry – sadly our Robin chicks didn’t make it. When we became suspicious and investigated, there were only two chicks left in the nest, one of which was very under-size, and both were dead. We think the most likely cause is the heat in the greenhouse, which can be intense early in the day. Luckily, the parents don’t seem to be thinking of re-building in the same place. 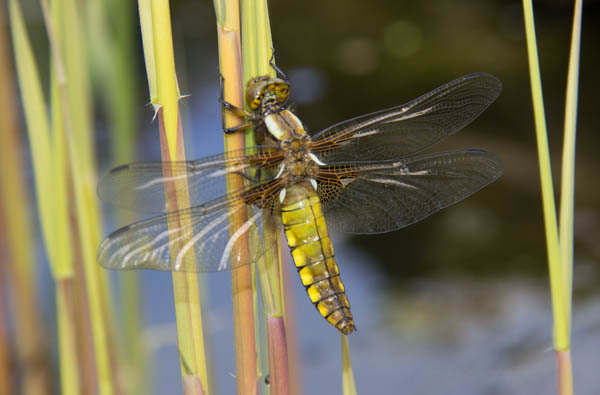 Nature is prolific, though, and in compensation, we’ve had a Broad-bodied Chaser female emerge from the pond. She’s the only one we’ve been aware of, but there may have been others: there were several larvae in there last year that I think were this species. There are still several big, but slimmer, dragonfly larvae in the pond, which I’m guessing are Southern Hawkers; in the past we’ve seen this species emerging around the end of May, so we’re keeping a very good eye on the pond. Our new pond has a few tadpoles which we moved from the old pond to keep them safe from the newts, and they are doing well, starting to grow their back legs. It’s fascinating to see what else is turning up by itself – all sorts of small water creatures. The other thing that has especially pleased me is seeing a female Brimstone butterfly investigating the buckthorn bush I planted as food for Brimstone caterpillars. I can’t see any eggs, though a lot would be too high to see, so I’m waiting to observe whether any damage to the leaves becomes obvious so I can see if there are caterpillars present; I’ve had one pointed out to me in the past, and their camouflage is so good, it still took me ages to actually spot it. I’m sad for the robins. Yeah for the bugs! A lot of other baby birds are turning up, so there was success to balance the failure!